Toy/ teacup poodles are no doubt adorable! These 3-8.5 lb dogs are sweet, fun- loving, cheerful little pals. They love to travel alongside with you and be cuddled-up on your lap. They have quite the personality and although small in size, they believe they're one of the big dogs! Winnie was born on March 17th and will be able to go to her new home around May 12th so long as shes 2 lbs in weight. At about 3.5 weeks of age when these pictures were taken on April 12th, she weighed 1 lb 2 oz. At this age, Winnie's charting to be around 6.5 lbs full grown. Winnie is medium to dark chocolate in color. 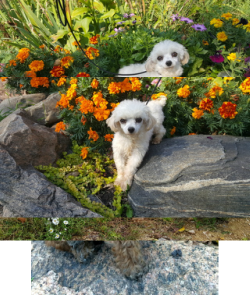 Luciana's puppies will likely be in between a toy poodle/ very small miniature. For this reason, Luciana's puppies have been posted under both categories. Microchip: Winnie will be microchipped around 5.5 weeks of age. Josie was born on March 17th and will be able to go to her new home around May 12th so long as shes 2 lbs in weight. At about 3.5 weeks of age when these pictures were taken on April 12th, she weighed 1 lb 5.5 oz. At this age, Josie's charting to be around 6.5- 7.5 lbs full grown. Josie is dark chocolate in color. Microchip: Josie will be microchipped around 5.5 weeks of age. If there are no profiles posted it means that we currently have no puppies of this gender or breed currently born, the puppies we do have have already been reserved and removed from our website, or the puppies are too young and their profiles haven't been posted. Please reach out to us if a specific breed, gender, or color interests you and we can let you know what's available or upcoming. Thank you!